After being treated with a novel gene therapy for blindness, patients who had lost their sight due to a genetic retinal disease could see well enough to navigate a maze, according to research presented today at the 2017 Annual Meeting of the American Academy of Ophthalmology (AAO 2017). Patients in the study had a form of blindness called Leber congenital amaurosis (LCA), an inherited degenerative retinal disease characterized by severe loss of vision at birth. This novel gene therapy for blindness is currently under review by the FDA for potential approval. There are no other FDA-approved treatments available for inherited retinal diseases. Stephen R. Russell, M.D. – an Ophthalmologist with the University of Iowa – is one of the lead researchers for this trailblazing treatment. Data from the first randomized and controlled phase III study showed that 27 of 29 patients treated with the gene therapy experienced meaningful improvements in their vision, enough that they could navigate a maze in low to moderate light. The treated patients also showed improvement in light sensitivity and peripheral vision, two common visual deficits experienced by these patients. Leber congenital amaurosis is a rare disorder, affecting about 1 in 80,000 people. The condition can be caused by any combination of 19 different genes. The most common cause is a defect in the RPE65 gene which produces a protein of the same name called RPE65. This protein helps the cells that nourish the retina – called the retinal pigment epithelial cells or RPE – to process vitamin A. The RPE cells of patients who have this mutation do not produce enough vitamin A, an essential nutrient that allows visual proteins to sense light. Fixing the condition requires delivering a DNA segment with a healthy copy of the RPE65 gene packaged in a vector made from a virus. 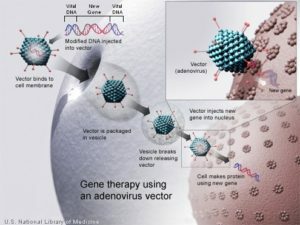 The treatment, called voretigene neparvovec (Brand name: Luxturna, from Spark Therapeutics), uses a harmless virus that is genetically modified to carry a healthy version of the gene into the retina. Ophthalmologists inject billions of these modified viruses into both of the patient’s eyes. Luxturna’s gene therapy does not restore normal vision. 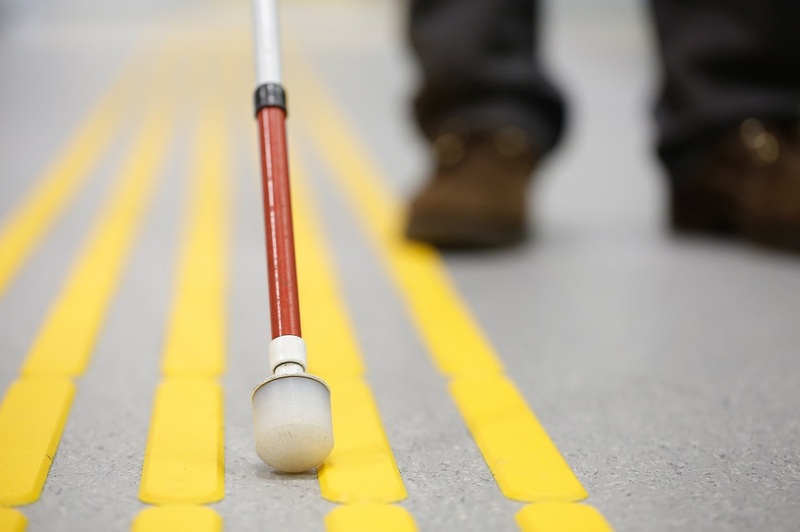 However, it allows patients to see shapes and light and enables them to walk around without a cane or a guide dog. Researchers are unsure how long the treatment will last. So far, most of the treated patients have maintained their vision for two years. The earlier gene therapy for blindness trials used a modified adeno-associated viral vector. (Click to enlarge) Credit: NLM. More than 200 patients with Leber congenital amaurosis have participated in trials of gene therapy for blindness since 2007. The first trial was supported by the National Eye Institute (NEI) and began in 2007 and used a modified adeno-associated viral vector to deliver the healthy RPE65 gene to the retina. In 2008, the researchers published the results of their three-month follow-up in the Proceedings of the National Academy of Sciences and the journal Human Gene Therapy. The latest phase III study presented at the AAO 2017 confirms the efficacy of this gene therapy for blindness. No other gene therapy has gotten this close to FDA approval for retinal disease or any other eye disease. In October of this year, an advisory committee to the FDA unanimously endorsed the treatment. The FDA is not obligated to follow the recommendations of its advisory committees, but it usually does. Observers expect the FDA to make its decision on this gene therapy for blindness no later than January 2018. FDA approval of Luxturna could open the door for other gene therapies that could eventually treat the more than 225 genetic defects known to cause blindness. For example, gene therapy could be used to treat retinitis pigmentosa, an inherited retinal disease caused by a genetic defect. Moreover, gene therapy could potentially provide key proteins needed to restore vision in more common forms of vision loss, such as age-related macular degeneration (AMD). Years of research using gene therapy are starting to bear fruit. Unfortunately, not all experiments are carefully controlled, such as the one presented at AAO 2017. For example, one man is self-experimenting with gene therapy to rejuvenate his aging body. The successful trial in treating blindness is only the beginning of the application of gene therapy. Researchers hope that gene therapy can be used to treat other forms of blindness, and eventually other diseases. Learn more about gene editing in this video on the Future of Medicine. (video) CRISPR 2.0 – New Ways to Edit Genes in Our Bodies – a video that explains CRISPR. MIT researchers discover a Revolutionary CRISPR Gene Editing with Nanoparticles. Discover how old human cells became rejuvenated with the compound resveratrol. British physicians say they have achieved “mind-blowing” results using gene therapy to rid people of hemophilia A.
American Academy of Ophthalmology. Genetic treatment for blindness may soon be reality. [Press release]. American Academy of Ophthalmology. November 11, 2017. Link to Article. National Eye Institute. The Research Road: Gene Therapy for Leber Congenital Amaurosis. National Eye Institute. (Online publication). Web. Retrieved Nov 11, 2017. Link to Article. (Video) Can These Revolutionary Technologies Beat Aging in Our Lifetimes?